There are a broad variety of Skip Morris presentations and each is a blend of information and humor. Skip is the author of eighteen books on fly fishing and fly tying (among them, Fly Tying Made Clear and Simple, Morris & Chan on Fly Fishing Trout Lakes, Trout Flies for Rivers, and Fly Fisher's Guide to Western River Hatches), is the host on six instructional videos (Tying Foam Flies, Fly Fishing for Bass & Panfish...) and has spoken for sportsmen's shows, fly-fishing shows, and fly clubs in Arizona, New Jersey, Toronto, Alabama, Illinois—all over the US, Canada, and overseas. Recently he and Lefty Kreh were co-headliners at the Great Waters shows in Chicago and Minneapolis. Skip's speaking fees run from $200 to $650 per day currently, depending on the distance to the event and the travel time required. Meals, airline tickets, lodging and such depend on the distance Skip will travel to speak and how many days he'll speak. Terms become even better with multiple days of speaking. This means that if you bring Skip in for two days(a club talk one day and a clinic the next), your costs per day will drop considerably. Some clubs will arrange to bring Skip in and speak to two or more clubs in a week, which also makes him considerably less expensive per day. The more days he speaks, the better the terms—Skip has spoken for up to four clubs in a week. 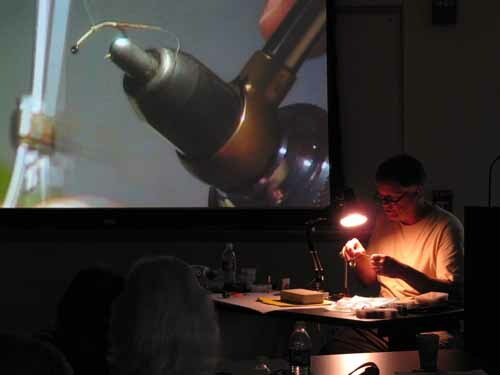 The links below take you to a list of Skip Morris presentations, including both PowerPoint shows and fly-tying clinics. with a camera-feed to the big screen.